I told you that you gals got me hooked on Francine Rivers. Sooo....I saw that she had this new novel coming out and instead of being one of the last to read one of Rivers' novels, it might be kinda cool to be one of the first. I have to say "one of" the first because my cohort, Lisa, from 5 Minutes for Books received her copy in the mail the same day as myself. Let me tell you folks, the competition between us was fierce as to who would finish it first! I really don't think that behavior fitting of Christian readers and sisters-in-Christ. Then again, she was very rude and deserved everything I typed. Heh heh. (We only drew our managing editor, Jennifer, into the fray once or twice so I think we were good big girls and managed our difficulties well.) All that to say, if you want to see what Lisa has to say about this book, then you can go over to 5 Minutes for Books and find out. As for what I thought of it, I thought it was poignant, engaging and frustrating beyond belief. I'll give you a quick run down of the story, and then I'll tell you what I mean when I used the above three words. Upon opening the book we meet Marta Schneider who lives in Switzerland with an abusive father and a sickly mother in a dysfunctional home. Her life is rough and her father has low expectations for his eldest daughter. Marta gets the short end of the stick time and time again until she eventually has enough of her home situation and goes off in pursuit of a personal dream to own an Inn. She travels in Europe until she eventually lands in California, married, and with children of her own. One of Marta's greatest fears is that her own daughter, Hildemara, will end up "spineless" and unable to face the challenges of life and so, despite her own growing up experiences under the hand of an abusive father, Marta seems to be repeating a bit of history by being emotionally abusive to her daughter. The focus of Her Mother's Hope is on the sin cycle that was "begun" by Marta's father and passed down to his granddaughter. It is a story of regret, heartache, and the painful wounding of family members. What is interesting about this book is that it is an exploration by Rivers of her own family history. She wrote this book while exploring her own grandmother's history and relationship with and to Francine's mother. This series is Rivers' way of understanding and relating to two strong willed females in her own family and therefore it is believably written - because it is truth. Now, when I say the book was poignant, I mean that the emotions that the characters felt were so moving that I instantly cared about them (and simultaneously wanted to lecture them endlessly!) The way that the characters in this book treat each other sometimes is quite awful. But then, the way we treat each other in real life is also equally frightening at times. When I say the book was frustrating, I mean that the characters are wrestling through some serious issues. We have people who are dysfunctional because of the emotional abuse that has been suffered and is being suffered by poor word choices. You just want to talk some sense into Marta! She is unbelievably harsh with her daughter, Hildemara and you can see her driving the wedge between them and it's painful to watch. Furthermore, the book rather ends on a cliffhanger so we have to wait until later this year to find out what is going to happen between mother and daughter. Her Mother's Hope is the first in a two book series about Marta. The second book, Her Daughter's Dream is due out in the fall (2010). How will you know if you will like this book? 1. You read it alongside a friend and both of you are working your way through it as fast as possible, each wondering what the other is thinking of it as you go along. 2. You like Fracine Rivers' books as a general rule. 3. You like well-written Christian fiction. 4. You like the World War II time period. 5. You like coming of age stories. 6. You like Fracine Rivers. This book is a hard book to read because of the frustrated relationships. However, as I've mentioned a time or two, Rivers' writes very well and so you'll be sucked into the story, regardless of whether or not you'd typically prefer the subject matter. 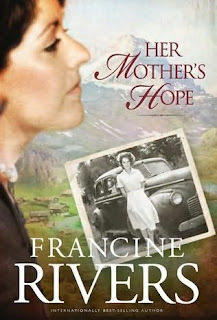 Francine Rivers is just a compelling author who has written an amazing story about family. If you think you'd like to win a copy, visit 5 Minutes for Books. Lisa has a copy to give away over there. But I didn't want to tell you that until you'd made it to the end of my review. Thank you for sticking with me. You may go now. Just be sure to tell Lisa I sent you and that you were here first! Oh you are SO funny!! And I will say that your review drew me in, because I love complex character-driven stories. As much as I've heard about Redeeming Love (and I do mean to read it sometime -- really, I do), this sounds up my alley. I like coming of age stories, well-written Christian fiction, WW2, and YOU. Well, 3,4,5 and 7 apply! This post and Lisa's were together in my google reader so I went to 5MFB first. I was very confused as I read Lisa's review because I'd assumed you'd written it. I do like #1-7, and this does sound like a compelling but possibly painful read as there was emotional abuse in my family. My father could be that way, but I don't think he realized he was. I don't know what made him that way -- and there is no one left to ask about it. Well there isn't anything wrong with uhm a little friendly competition. Your friendly competition to finish reminds me of my own reading competition that I used to have with my sister. I really want to read this book after reading your review. I've enjoyed Francine Rivers other books for the most part (except for her short novellas which I didn't like). Fantastic review! Now that I know more about what the book is about I have a feeling I will need to have tissues on hand as I read. Thanks for sharing your review and thanks for posting the link on the Book Blogs ning where I found it! Thanks for the giveaway referral - I let her know! Thanks for the laugh! I'm sitting here in front of my 18yo daughter (who is working on her computer) and I'm laughing and making her wonder what I am laughing about. 1. I enjoyed the story of how you and Lisa read it at the same time and had that "friendly" competition! 2. I like Fracine Rivers' books as a general rule. 3. I like well-written Christian fiction. 4. I like the World War II time period. 5. I (sometimes) like coming of age stories. 6. I like Fracine Rivers. 7. I like you (even though we have never met!). So, I think it will be the next one I read (after the ones I have to read by the end of next week! ).